This is a flint knapping tool I use a lot, as English flint seems to be quite tough this will get larger / longer flakes as you can get more leaverage. The long handle is gripped under the arm and the weight of the body can be used to build pressure before the angle is tilted to initiate the flake. Here we have three different types, the one on the right is tipped with a piece of solid antler. This is made from organic materials I made for a flint knapping demonstration last summer. The tip is on the large side but works well. The one on the left is the one I use for most of my knapping. It has an allen key grub screw so that the metal tips can be changed quickly for different tasks, the tip in the end of the Ishi stick is copper, and next to it is one made from a large steel nail and also another (from a steel nail) with a flattened end which works really well for notching. The Ishi stick in the middle is the one I use for crunching in steep flakes along an entire edge, and preparing the platforms on a biface before further invasive pressure flaking, I have posted a pic of this a while ago as "the never sharpen pressure flaker"! It is flattened copper rod but left much thicker than the steel notcher tip and is non adjustable. 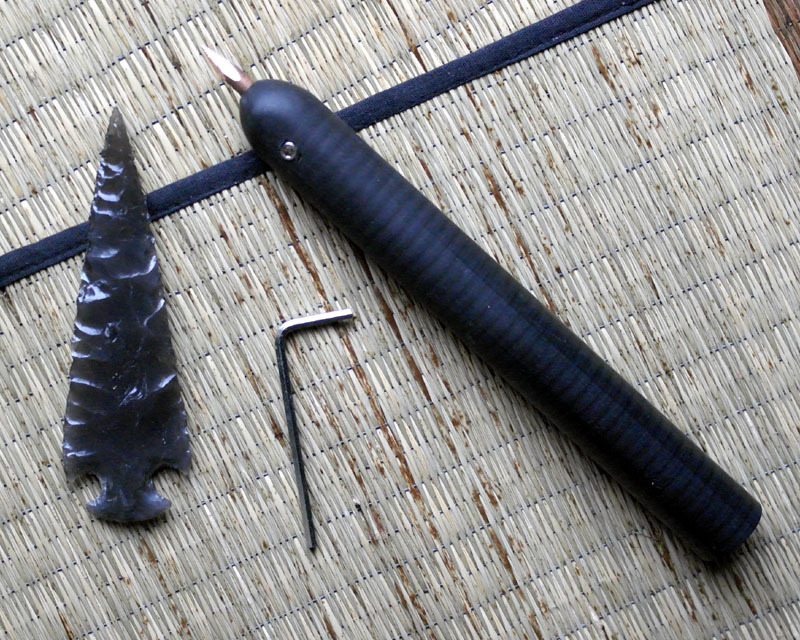 I usually flit between the flat and the sharp Ishi sticks whilst knapping an arrowhead or finishing a spear or knife by taking a row of invasive flakes with the sharp point, then steeply crunching in the angle for the other side with the blunt flat stick, a quick grind and then flip it over for the next series of invasive pressure flakes with the sharp tip again. Here is a close up of the proddy ends, the sticks themselves are from straight seasoned hardwoods, I think we have here: Sycamore (left) Ash (middle) and Hazel (right) but a broom handle will work just as well! Very solid looking tools there. I have to admit, I'm an Ishi convert, and only use my 2 Ishi sticks now (one splayed tip, one sharp). I must try the grub screw fixing, as mine are developing a bit too much flex between the tip and the stick. If I may say so myself they're effective, and not so twisty on the wristy. I do use the short handled pressure flaker too but mostly for small arrowheads or for trimming up when things get thin and fragile and not so much grunt is required! 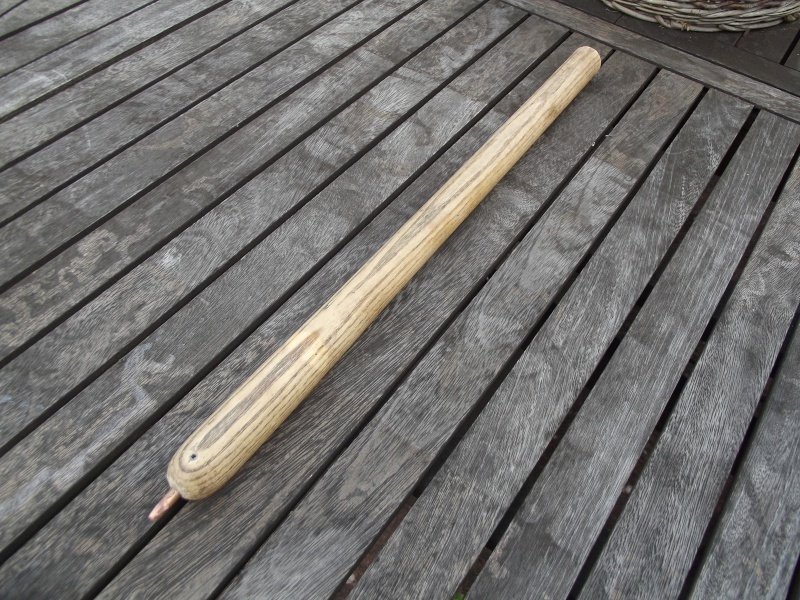 Just to say for anyone wanting to know sizes: the "stick" is around 50cm long and 2.5 to 3.5 cm thick. The tips are around 7mm thick copper rod or standard large mild steel nails. They look really good, did you make them yourself? Have to admit I've never worked out even how to hold an ishi stick properly. Yup, I tend to make all my tools. I do have an American flexi ishi stick that my mother got for me for christmas a few years back but the thing is too bendy if you ask me. give me wood (fnaaar!) over plastic for a handle any day. About the grub screw flaker, the screw threw would be made of wood, how it this holding up? Also what size grub screws do you use? And one more thing, how did you drill the hole for the copper rod and keep the hole straight up the middle? Ah, the hole for the rod is drilled freehand and you hope it's straight. If a little too off centre you drill the other end and hope it's betterand use that instead! The grub screw is then drilled in from the side using a drill bit the same diameter as the inside of the thread, you will need an allen key grub screw around 5mm diameter to hold the rod, get the screw first then measure your hole size from it. 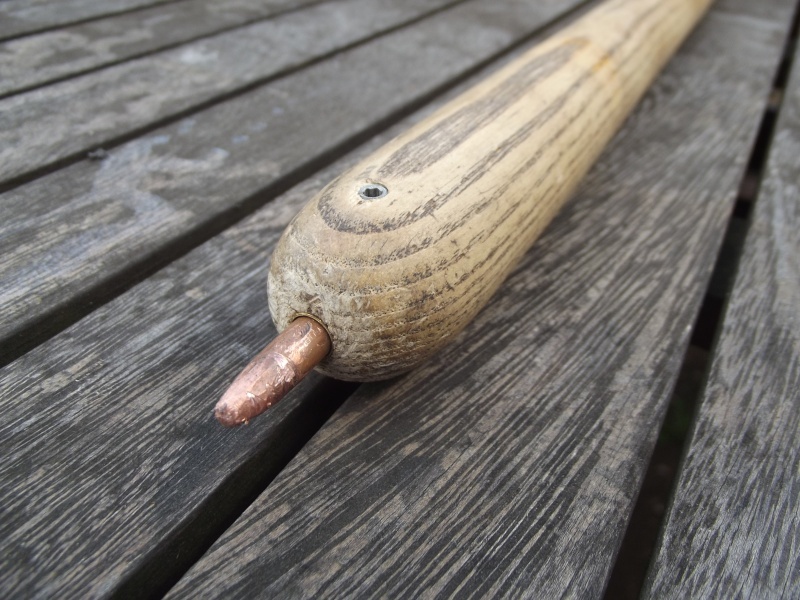 Once you have drilled into the first hole for the copper rod, get the grub screw with the allen key and slowly and firmly get it to "tap" into the wood by turning it with pressure at first, it will turn easier once it's got a grip. They seem to hold up to the pressure and abuse from use. Though the grub screw is just held in by the wood and the tight fit around the screw I've not had one unthread or get loose so far. Thanks definitely going to have a go, the drilling bit seems the main problem. Smart and always good to see some ones tool kit, I like the grub screw idea, - I have been working on a few new tools myself by welding old copper pennies together. I also like to see a bit of natural wood been used. I make it sound really complex, it's just a couple of holes that join! I made one from some pretty dense wood, works great. I also cut down a Holly tree in the local wood, naughty me, but it is serious overrunning the place, and am now waiting for it to season. Hopefully it will prove a good wood for them. Also I got some nylon bars on order. Just need a really long drill now. Holly is a good choice, nice and straight and has green bark, tough stuff too. As for Nylon, I have one of those flexable ishi sticks from the U.S. and it's too bendy to get some real umph behind, one for heated rock and glass perhaps? I got a couple from the US, a thick 22-23mm that has no bend and a thinner 15mm that doesn't have too much bend. The ones I am making now are 20mm thick so most likely will have no bend. However on the bend front I am knapping a lot these days with springy steel nails because copper has no bend in it, the steel nails bend and when you release the flake the release of store energy seems to remove a longer flake. I believe this is the theory of how antler differs from copper, it also compresses under pressure so also stores up energy which add extra oomph as the flake releases. Here she is, finished the first one. I'm with you on the steel nails, they do work and I've been knapping with them for about a year now, I set up a copper tip now and then but not much. That flaker looks really good BTW! very modern, mine are just old broom handles. Well this is my new(ish) Ishi stick, made from an oak handle of the gardening veriety, the tip is really worn and could do with a re-sharpening. The drilled opening for the pressure flaking rod has a brass tube insert with a filed hole for the grub screw to pass through. And this is the whole thing, it's about 50cm long like the others but the brass tube seems to stop the tip from widening the wood and wobbling about and the grub screw is on the same plain as the wood grain. So far it has worked really well. Nice idea with the brass tube, first time I've seen it. Me too. The tube is from scale modeling stock, an old geekism of mine! Comes in .0 mm sizes, one will size will fit into another. Sorry if this is breaking any rules about Necro Posting but I was thinking of making myself an Ishi Stick and was wondering if I could use a piece of broom stick I have lying about propping up the wall? Hi, one of mine is just abit of old broom handle, and it does the job well enough for me.